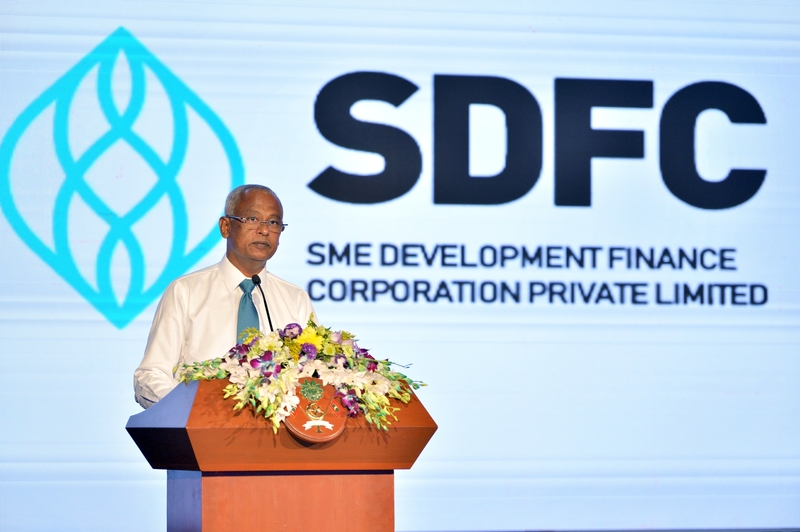 President Ibrahim Mohamed Solih has stated that the introduction of SME bank services and the introduction of Agricultural loan scheme would be an incentive for the development of small-medium businesses and that the sustainability of these SME’s would ensure economic stability in the Maldives. He stated this while delivering remarks after the inauguration of SME Development Finance Corporation Pvt. Ltd. held at the National Art Gallery this morning. Speaking during the ceremony President stated that the introduction of an SME bank and the introduction of a credit loan scheme for agricultural purposes are some of the key pledges to be fulfilled during the first 100 days of the government. He further stated that these were included in the pledges under the objective of providing direct profit to the civilian and strengthening the economy of the country. Speaking in this regard President noted that the introduction of the SME bank services will be key to the emergence of several young businesses and that this would enable the showcasing of capable products of Maldivians, especially products by women. He also stated that this would bring positive changes to the economy and will give the opportunity to those individuals who wants to earn income while staying at home. Hence, President Solih deliberated that a portion of the SME loan scheme would be targeted to women, youth and people with disabilities. Moreover, President Solih emphasized that in order to attain the kind of development we need for the Maldivian islands and based on the current situation of the country, it is very important to increase the number of emerging small medium enterprises rapidly. He underscored that the main objective of creating a government SME bank is to make it easier for small medium enterprises to get start up loans. President Solih also stated that the main four categories of lending will cover guesthouse loans, business assistance loan, agricultural loans and asset loans which would be lended in a marginally small interest rate. Speaking more at the ceremony, the President shed light on the fact that the aim of the agricultural loan would be to enable more profit to the farmers and to provide more quality products to the market, which would in turn enhance organic food availability and promote a better healthy society. Moreover, President Solih stated that in order to encourage and accept such efforts, the government has decided to give out awards to SME’s who excel in productivity.